The global tropical fruit puree market exhibits a highly cutthroat competition mainly due to the presence of innumerable players, observes Transparency Market Research based on a newly published report. This market also depicts a selective presence, mainly in tropical regions, as availability of source material in these areas is higher compared to other geographical extents. Notable focus is being imparted by the players on implementing key strategies such as improving geographical reach, enhancing product quality, and achieving product differentiation, to survive in global tropical fruit puree market. Improving production capacities, enhancing growth rate by implementing better product marketing, and striving towards regulating product costs are few other schemes implemented by major players to establish their standing in the global tropical fruit puree market. The competition is expected to intensify further owing to new players regularly making their foray in this sector. Kerr Concentrates Inc., AGRANA Beteiligungs-AG, Kagome Co., Ltd., Dohler GmbH, Tree Top Inc., ITC Limited, Capricorn Food Products India Ltd., SVZ International B.V., Aditi Foods India Pvt. Ltd., Inborja S.A., Superior Foods Inc., Conservas Vegetales de Extremadura S.A., KUO Group, Kiril Mischeff Limited, Mother India Farms, Ingomar Packing Company LLC, Quicornac S.A., Citrofrut S.A. de C.V. are key companies operating in the global tropical fruit puree market. 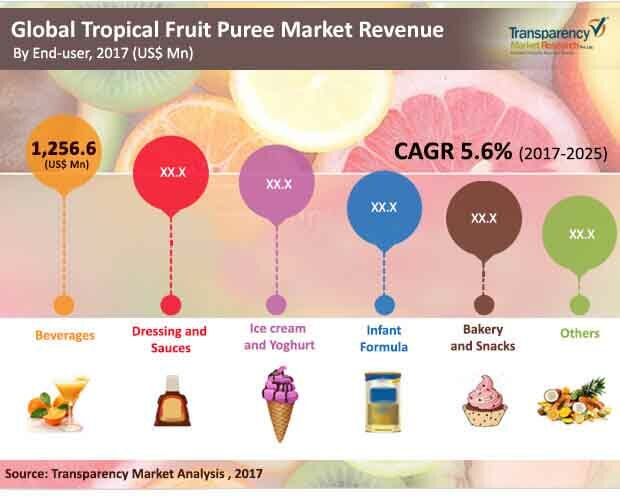 The global tropical fruit puree market gained revenue worth US$3519.9 mn in 2017, which is further expected to reach a figure of US$5749.2 mn until 2025. This growth is projected to rise at a steady CAGR of 5.6% during the forecast period ranging from 2017 to 2025. The tropical fruit puree market is mainly being powered owing to a high demand of the products witnessed all over the world. Many people prefer using puree nowadays instead of natural fruit juice, mainly due to unavailability of certain seasonal fruits, as well as better texture and blend found in the former category. This also has been responsible for driving the global fruit puree market substantially. Widespread advancements occurring in the field of food and beverages, especially in the fruit puree and syrup manufacturing industry have also managed to boost the market’s growth. Fluctuating raw material prices, shortage of adequate manpower required for product manufacturing in certain remote regions, and lack of expertise in remote areas are few factors that are primarily hindering the global tropical fruit puree market. Moreover, the market is also being hindered due to allergic reactions caused by the tropical fruit puree products in some people, thereby restricting the number of targeted customers. Nevertheless, several companies are carrying out extensive research and development in the field of tropical fruit puree product manufacturing. This is expected to make them release non-allergic as well as cost-effective tropical fruit puree materials that can be readily used in different foods as well as consumed in various forms. This can consequently offset most restraints affecting the market. The competition is expected to intensify further owing to new players regularly making their foray in this sector. The tropical fruit puree market is mainly being powered owing to a high demand of the products witnessed all over the world.